Eastern Canadian Arctic, the region my bowhead field work is conducted. How adaptable are bowhead and North Atlantic right whales to environmental change? Problem Climate change is predicted to continue to alter biotic and abiotic conditions of marine environments. Such changes will affect marine predators as the quality and quantity of their prey shifts overtime. However, the manner in which different species will respond to environmental change is unknown. Bowhead whales (Balaena mysticetus) and North Atlantic right whales (Eubalaena glacialis) are examples of two closely related species (genetically related with similar morphologies and diets) with different physiological adaptations that could result in divergent responses to environmental variability. Research Questions How will bowheads and North Atlantic right whales fair in a changing environment? Is one species better adapted to deal with fluctuations in food quality and quantity? Much is known about the diet of North Atlantic right whales throughout their range. 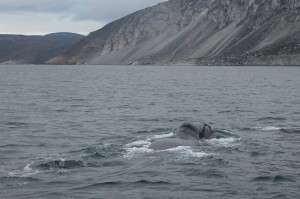 However, little is known about bowhead diet, particularly in the eastern Canadian Arctic. The bulk of my research will focus on determining the primary prey of bowheads in the eastern Canadian Arctic from Cumberland Sound up to Clyde River (an arm of Davis Strait) in collaboration with Fisheries and Oceans Canada, University of Manitoba and Nunavut Department of Environment. The foraging behavior of bowheads will be further studied by examining archived SPLASH tag data. SPLASH tags have been used to track movement patterns of bowheads using satellite telemetry and time-depth profiles. 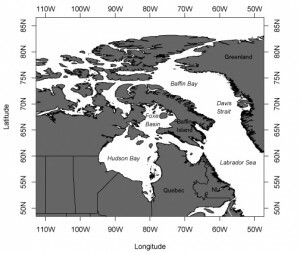 Movement and habitat use patterns will be determined for bowheads in the eastern Canadian Arctic and these results will help determine where key foraging habitats occur. The data collected will be used to determine: 1) where feeding grounds occur in the eastern Canadian Arctic; 2) what species of zooplankton bowheads rely on; 3) how energetically rich their prey is and; 4) how much food they consume on a daily basis. 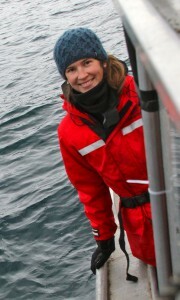 Once my field and laboratory work is complete, I will compare the diets and food requirements of both species (quality and quantity) and using forecasts of future zooplankton changes, I will evaluate whether bowheads and North Atlantic right whales will be able to make a living under different climate change scenarios. Fortune, S.M., A.W. Trites, W.L. Perryman, M.J. Moore, H.M. Pettis, and M.S. Lynn. 2012. Growth and rapid early development of North Atlantic right whales (Eubalaena glacialis). Journal of Mammalogy 93:1342-1354. Fortune, S.M., A.W. Trites, C.A. Mayo, D.A.S. Rosen, and P.K. Hamilton. 2013. Energetic requirements of North Atlantic right whales and the implications for species recovery. Marine Ecology Progress Series 478:253-272. Right whale images taken under NOAA Fisheries permit 633-1763, under the authority of the U.S. Endangered Species and Marine Mammal Protection Acts – please request Provincetown Center for Coastal Studies permission for use. The bowhead whale movement animation was made using a R function created by Dr. Brian Battaile, Research Associate at MMRU.